Join us in celebrating the conclusion of the West Bottoms Reborn project with a public exhibition featuring work by the KCDC urban design studio and West Bottoms Reborn Design Team Artists. In addition to the exhibition, project sites will feature temporary public space activation. There will be a formal reception for the exhibition on Thursday, May 10th, from 5 pm - 8 pm. Description: Join us on a walking tour of the most photographed sections of the West Bottoms. Along the way, we'll decode the hidden language of street art and discuss the history of the local scene. Cydney Millstein, an architectural historian and author of Houses of Missouri, 1870-1940 (Acanthus Press, NY: 2008) will lead a tour of the historic West Bottoms focusing on architecture and bridges. Ms. Millstein’s firm, Architectural & Historical Research, LLC, was founded in 1983. Description : Drive, walk, imagine and reclaim a past between memories, a meandering river, rambling streets - concrete and metal spans. Bring a lunch for a picnic and talk. Description : Cydney Millstein, an architectural historian and author of Houses of Missouri, 1870-1940 (Acanthus Press, NY: 2008) will lead a tour of historic Strawberry Hill focusing on architecture and bridges. Description: Did you know that the majority of cowboys driving cattle up and down the Midwest were people of color ! Join us for a unique presentation on the histories of cowboys of color, as we welcome our special guest lecture from The National Multicultural Western Heritage Museum in Fort Worth, Texas. Description : Amanda Gehin, artist and native plant specialist, will lead a walk on the Kaw Point trail where she will identify existing plant species and discuss the botanical history of the place. Kaw Point is a significant ecological and historical site, being at the confluence of the Kansas and Missouri Rivers, and our walk will occur during a significant botanical time of year- ephemeral season. Amanda’s narrative will focus on ethnobotanical information. Location: Secret. Discloser upon RSVP Confirmation. Description: KC's favorite reflection in a dirty puddle, the King Of Herrings, invites you to partake in a unique tour of the West Bottoms' peculiar auditory environment. Cast aside the burden of your sight and allow your other four (five?) senses to rise to the occasion. Participants will don blindfolds and commune with some of the West Bottoms' not-quite-human denizens . Though involving no physical risks, this experience is not for the faint of heart. Step off daytime's stage, if you dare, and into the darkened wings. 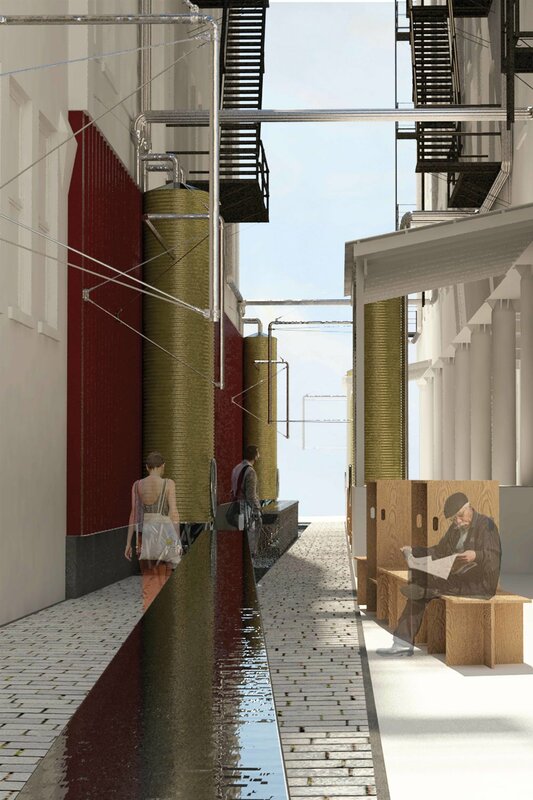 Description : Outwards [Inwards] Upwards / /: Sound and Space A sound migration from 1-670 to the 12th St. Alley. Sound, like plants and water, finds its way into the nooks and crannies of everywhere not specifically designed to repel it. The 2 hour video installation and performance flows, migrates, and relocates from underneath the 1-670 Bridge, in the West Bottoms, with its vertically closed, but horizontally open space, to its spatial inversion in the 12th Street Alleyway, with vertical openness and horizontal confinement. Along the way, a pocket of musicians, and a few 21st Century troubadours vacillates between these two spaces. Like the cracks in the brick mortar, now supporting plant life, so our sound invades the pathways and alleyways of the city, where sound knows no bounds, and maximally respects open space. West Bottoms Reborn and the King Of Herrings invite you on a tour of the West Bottoms like no other. Descend into the vaults of Kansas City’s cathedral of beef and brick, close your eyes, and experience a pleasantly spine-tingling late October evening with all other senses heightened to maximum acuity. Participants will be blindfolded and led on a route that foregrounds the West Bottoms’ unique auditory and psychic environments. Those attending this tour may find themselves communing with the familiar spectres of the season, the deeper spirits of the landscape, or even the greater vacant genius that haunts those places which are completely clean of ghosts. Spaces are extremely limited for this one-night event. Participants should wear sturdy, comfortable footwear that can take a bit of dirt, and outdoor-appropriate clothing. Participants should be aware that this tour, while physically safe, may push some boundaries of mental comfort. The Land Institute is transforming agriculture through scientific research in perennial polycultures and through educational projects that spread a new way of thinking about the relationships between plants, human places, and the planet. Participants in this workshop held at the Perennial Agriculture Project Field Station near Lawrence, Kansas, will engage with The Land Institute’s work through presentations, experiential activities, and discussion. The workshop will be led by Aubrey Streit Krug, a postdoctoral fellow in Ecosphere Studies at The Land Institute. Any serious investigation of Kansas City that did not account for the West Bottoms would be woefully incomplete ! The same could be said of any investigation of the West Bottoms that does not account for Turkey Creek. The histories of these two features are irrevocably intertwined, geologically, geographically, and culturally. Ironically, in present times, these two bodies no longer interface, at least not in any obvious way. In 1913, the construction of the Turkey Creek Diversion Tunnel, made it so that the bulk of the watershed preemptively drained into the Kaw, avoiding the floodplain where it once found confluence. The purpose of this diversion was to allow for the installation of the early 20th century's largest sewer ,still in place just south of Kemper Arena. The Turkey Creek Sewer is profoundly responsible for the West Bottoms we know today, making it possible for a mostly dry floodplain just in time for the Industrial Era. It is a phenomenal constant that water flows downhill, though you may find this is no longer an observable event as we explore the Central Industrial District of the West Bottoms. Join the Turkey Creek Institute for Phenomenal Awareness as we examine this scientific discrepancy and the simulacra that it has enabled. ATTENTION ! You WILL need to wear water repellent footwear, galoshes, or rubber boots. We seek to raise phenomenal awareness in the public by fostering engagement with Turkey Creek. Some interesting frameworks for engagement have been photographic archiving, psychogeographic exploration, local histories, and landscape ecology. Turkey Creek is a modest watershed that exists entirely within an urban environment. It can be found beside, beneath, or near Interstate 35 as it travels through Johnson and Wyandotte Counties in the Kansas City, Kansas metropolitan area. The valley formed by Turkey Creek has served as a navigation route for hundreds of years. Its current environment is dominated by light industry, commercial development, auto and railway infrastructure, suburban residential neighborhoods, and engineered flood control constructions. Despite the heavy traffic of the area, many native residents have never engaged with Turkey Creek, some admit to having no awareness of it at all. What would it mean to rethink this creek as a place for learning rather than ignoring, for immersion rather than evasion, for involvement rather than abandonment? Any serious investigation of Kansas City that did not account for the West Bottoms would be woefully incomplete ! The same could be said of any investigation of the West Bottoms that does not account for Turkey Creek. The histories of these two features are irrevocably intertwined, geologically, geographically, and culturally. Ironically, in present times, these two bodies no longer interface, at least not in any obvious way. In 1913, the construction of the Turkey Creek Diversion Tunnel, made it so that the bulk of the watershed preemptively drained into the Kaw, avoiding the floodplain where it once found confluence. The purpose of this diversion was to allow for the installation of the early 20th century's largest sewer ,still in place just south of Kemper Arena. The Turkey Creek Sewer is profoundly responsible for the West Bottoms we know today, making it possible for a mostly dry floodplain just in time for the Industrial Era. It is a phenomenal constant that water flows downhill, though you may find this is no longer an observable event as we explore the Central Industrial District of the West Bottoms. Join the Turkey Creek Institute for Phenomenal Awareness as we examine this scientific discrepancy and the simulacra that it has enabled. Please wear shoes for walking !